The Pride Go-Go Elite Traveller is a "classic" travel mobility scooter which is extremely popular amongst both advanced and beginners alike. It has a compact design which allows it to be manoeuvred within a tight space while providing excellent outdoor performance. What people really love about the Go-Go is how easy it can be disassembled ready for further transportation or storage. It can be broken down into 5 easily manageable lightweight sections. In fact, the heaviest part of the mobility scooter weighs a mere 15.4 kgs. The delta tiller gives you the option of left or right-handed operation while the wraparound handlebars is a comfortable place to rest your wrists. A wig-wag controller enables you to move forwards or backwards using only one finger. The comfortable padded seat can swivel to make side transfer much easier. So that the optimum driving position can be achieved, the height of the armrests and tiller can be adjusted. There's also a convenient front basket for you to store personal items or a little bit of shopping. Thanks to the 12 a/h battery the Go-Go Elite Traveller has a travel distance of up to 10 miles, giving you the option to cruise around the local area or travel a little bit further afield. 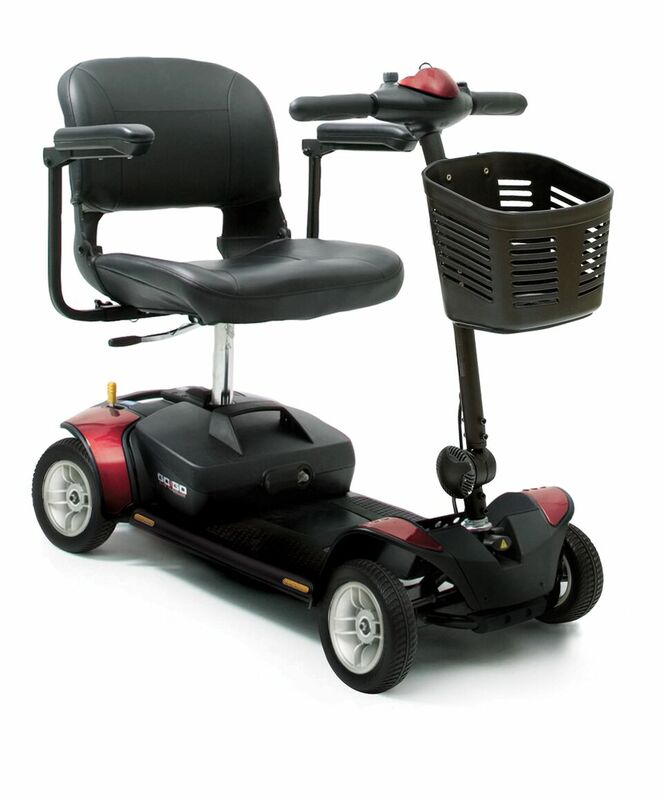 With this scooter, there's also an option to upgrade to a 17 a/h battery which will increase the range to 13 miles. Simple to use, store, and transport the Go-Go Elite Traveller delivers excellent performance in many different scenarios. The colour can be changed by making use of the interchangeable shrouds - available in red and blue. If you're interested in a demonstration of the Go-Go Elite Traveller or any of our travel scooter, then please call us on 02392 255600.